in so many ways. Tennis will help you a whole lot with your life’s attitude, in terms of you having a positive one, which will influence your way of living in general. Tennis is ABOUT an activity that will also help you so much in staying Healthy, plus also help you in many ways you can’t even imagine!! It’s ABOUT a game (sport) that in my very honest opinion is in a category of its own!! It’s ABOUT feeling “JOY” when you hit a great shot, or win a very tough match. It’s ABOUT figuring things out!! It’s ABOUT figuring yourself out!! It’s ABOUT a game you are able to play between ages of 3-4 and 80-90′s years old. It’s ABOUT going many different places, it’s also ABOUT meeting lots of new people!! There’s no greater JOY for me than when a STUDENT of mine LEARNS TO HIT A TENNIS STROKE with the CORRECT “SOUND” PROPER BASIC FUNDAMENTALS!! It is PRICELESS for me that, from then on, they really UNDERSTAND the correct STROKE MECHANICS that I have so passionately taught them, and now CAN easily EXECUTE them!! I just LOVE IT when they GET IT, and become ABLE TO DO IT!! It’s all ABOUT Learning “FOR REAL” the Correct, EFFICIENT, Effortless & Painless STROKES that will IMPROVE FOREVER!! The Students’ Mission now?? Practice!! My mission – Accomplished!! 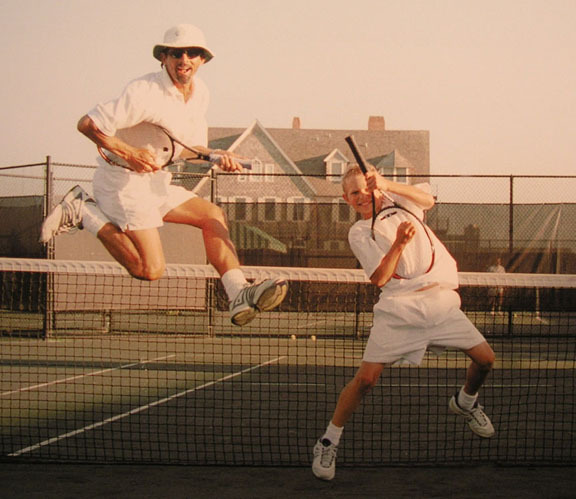 Teaching and Coaching Tennis for me is all ABOUT a very strong commitment to excel as a professor of the game. It’s ABOUT getting positive results consistently with any type of student!! It’s ABOUT putting a big smile on my students’ face when he or she hits a perfect shot!! It’s ABOUT helping people reach their true potential, and play better than they thought they could in their wildest dreams!! It’s “big time” ABOUT using my Physical Education Bachelor Degree knowledge of the human body when it comes to understanding each and every individuals’ own capability and projected true potential. It’s ABOUT using my own style and methods, with countless very helpful analogies, most of them much based on our day-by-day normal activities and actions, and many other sports too. For me, it’s all ABOUT making all the basic stroke fundamentals easy to understand and easy to do, with my own methods, matured and refined in 30 plus years of teaching and coaching experience!! So for me, in a nutshell, Teaching & Coaching Tennis is ABOUT Getting The Job Done!! Always!! No Matter How Challenging it is! !